The UC San Diego microgrid has over 33 megawatts of installed onsite generation, including gas-turbine cogeneration and storage, solar, fuel cell, steam, and diesel. The onsite generation is only enough to support critical loads. To cover the rest of their load demand, the university purchases additional electric power from SDG&E. The idea behind UC San Diego’s microgrid was that any time there was a disturbance in the main grid, they could disconnect and maintain power to critical facilities. However, during the 2011 Southwest blackout, the UC San Diego microgrid disconnected from the main grid, but did not shed load quickly enough. This caused their cogenerators to shut down and many important facilities to temporarily lose power. Operators manually restarted the generators, but it took five hours before power was finally restored to the entire campus. The university couldn’t risk something like this happening again. They needed a reliable way to shed noncritical load and maintain power to critical loads at all times. That’s when UC San Diego engineers began looking for a solution and in 2013, contacted SEL’s Engineering Services. After listening to the situation, the Engineering Services team proposed their POWERMAX Power Management and Control System. POWERMAX is ideal for onsite generation and has automated control functions specifically designed to detect and mitigate system blackouts. 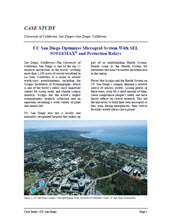 Over the next two years, SEL engineers created a custom solution for UC San Diego. The project scope ranged from the initial discussions to design and specification to developments and settings to Factory Acceptance Tests (FATs), and finally, to commissioning.